Treat your accordion like it’s your child, your pet and your best friend by not leaving it in a hot car, outside in the rain, or alone. It is expensive and not a toy. Own it. It belongs to you, so take care of it. 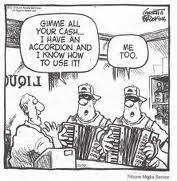 Don’t allow anyone to touch your accordion, put it on and try to play it without your permission. As with any nice instrument, someone will be enticed to try it, if it’s accessible. But, they may break it, or take it. On a gig, while setting up, keep it in your gig bag and carry it with you when you take a break. Set your boundaries, stick to them and be in control because you are responsible if anything happens to your instrument. 2) Stand up when you perform so that your audience can see you. You are more likely to interact with them, move more freely, play more expressively, make eye contact and be entertaining. Seated accordionists have a tendency to look down and away from the audience and seem remote and aloof. Your intention should be to ‘engage’ the audience, and bond with them. If you are unable to stand, perhaps your piano accordion is too heavy for you. You could exercise to build strength or get a smaller or lighter accordion–or both. Piano accordions built today with new age materials weigh substantially less than in the past. A disproportionately large piano accordion is distracting. Your instrument should fit your body, be comfortable and have enough bass keys for you. To help eliminate shoulder strap slippage, obtain a set of thickly padded, suede or velveteen shoulder straps for your instrument. A back strap will keep straps from slipping off of your shoulders, but if you need to go through some gymnastics to secure it, then it may look like you are having a problem with it. Having someone help you with your back strap, backstage, will mean that you will be walking onto the stage with your accordion already on. You may not be able to see equipment lying in your way and you could trip and fall. Head off equipment failure. Check your shoulder straps for wear and repair or replace them, in advance. Breakage may occur when you are in the middle of performance, and it could mean disaster for you. Always, just beforehand, be sure to check your wrist strap to make sure it’s comfortable, and that the nut that holds the strap in place is not loose. Tighten with an extra twist because if it is too loose, the nut may drop out and the strap will flop free–and it could be a huge problem for you. Just as a broken string is to a guitarist, things happen on stage, but try to minimize that possibility. Pro musicians know their equipment, walk confidently onto the stage, pick up and/or put on their instrument, perform while standing, then easily remove it and leave the stage when finished. Just as any professional musician would do with any instrument, you should strive to do the same with your accordion, without any problem. Practice with a purpose, systematically, every day for at least one hour. No matter what type of accordion you have, practice the bass section of your accordion. Don’t be just a “righty” player! 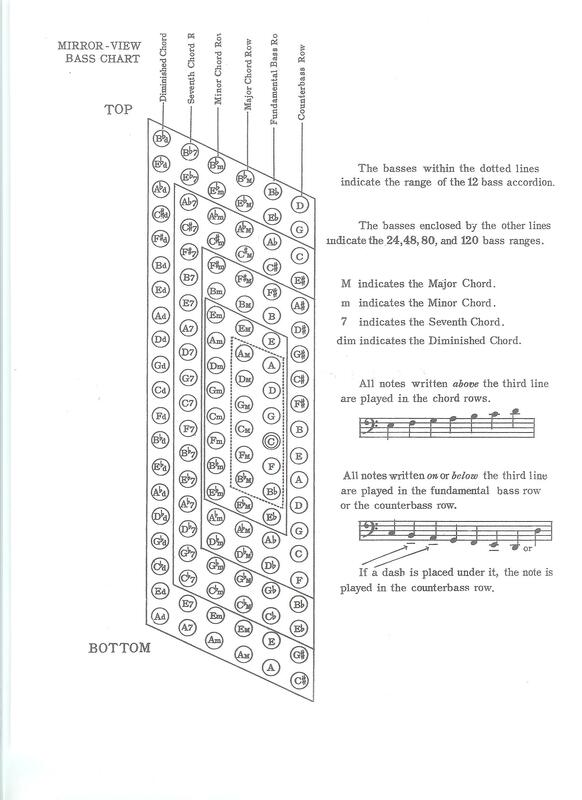 Knowing and using the bass section is essential to give your music dimension and depth. Click here for Bass Map . If a bass player’s notes conflict with your bass notes, get together to talk and come to an agreement. Practice your bellows action so it is as smooth as possible. Work with your accordion teacher on the technique of phrasing, or when to inhale, and exhale (much like a singer does) with the bellows. This control will help you to blend in with the other instruments, yet stand out when necessary. Work on a list of songs, about 6 at a time. Systematically play one after the other, each for ten minutes, every day for a week. Assuming you know the piece well enough, at the end of the week, it drops off and is put on a different list of songs that you already know. Once per week you will revisit those songs and refresh your memory. A new song is placed on your practice list, to replace the one that you removed from the list. This system will guarantee that you are always working on new, yet not forgetting the old songs that you took time to learn. Or come up with your own system. The point is all about managing your time and effort, and you shouldn’t waste either. Work with a metronome to check the consistency of your speed and timing. Practice your performance. Begin with a quick introduction, get into the piece quickly, take your time with it to play it well, then end it smoothly. Why do you need an introduction? So you can settle into the song and draw the listener in. It gives you a chance to get the right tempo and reminds you if you are in the right key. You are also practicing so that you hit the right notes, because it will be obvious if you don’t. Wrong notes will kill your performance because there is no room for forgiveness. Practice. The piece should be arranged and appropriate for the accordion, for you and for the setting. Do not just “wing it”. Put a great deal of thought and care into how you present yourself. Dress to fit the setting and for your performance. Strive to perform each piece from memory, never sheet music and not an Ipad, if you can avoid it. As a musician, you are not just playing music, you are interpreting it and giving a performance. So, don’t let anything come between you and that objective. Time each piece so you know how long you will need for your performance. Really great performers spend copious amounts of time on preparation, so that it becomes second nature. 4) Choose music that is special. Song choice is important to your audience and affects their perception of you. Play only music you can play well. Don’t feel you have to “play everything”, then perform passably or even badly; or comply with requests to “play a polka” if you haven’t learned to play them well. They are a very demanding genre. Choose a musical genre that you love, dedicate yourself to those songs, and get proficient at playing that type of music. Write a personal ‘Mission Statement’ so that you can develop a clearly thought out vision with goals and objectives to help you to decide what you are trying to accomplish, as a musician. Depending on your vision, selecting from multiple genres might be the best strategy. Whatever you decide to do is up to you. If you compose your own music, care about your work. Take time to arrange and practice your songs so they sound great on your instrument and you perform them well. Subject them to the same care and high standards as you would had they been written by any well-known composer. 5) Be sensitive to how the accordion is presented to others. By not being well presented, any musical instrument can be annoying. Getting together with fifteen other accordionists (or fifteen of any one instrument, for that matter) is fine if you have an orchestra, a club and want to share ideas. But, please recognize that, especially playing in unison, such a public display is too intense for most audiences. To those maniacs that think it is fun to use accordions, as a group, to assault diners with obnoxious and childish performances—unless they ARE children, I am sure that this approach does not teach people to care about the accordion. In fact, it’s predictable that a negative impression of any instrument will be formed by such tactics. Referring to it as a “squeezebox” does nothing to reinforce the fact that the accordion is a musical instrument, not a silly noisemaker. By using the accordion as a prop or a lame joke, not only is the image of the accordion seriously diminished, but your image will be, as well. This doesn’t mean you can’t strive to be humorous and entertaining. But, be careful–humor is a powerful tool and can form an instant and a lasting impression. You are not a buffoon and will not be thought of as one, if you take the accordion or whatever instrument you play, seriously, and have some self-respect. Think of it this way: if you owned a business and produced a product for sale, it is a losing business strategy to teach people that your product is a big joke. It is counterproductive and you will gain nothing because no one will ‘buy’ your product. Then, you will be left to fight the very perception that you have created. Your performance is a ‘teaching moment’. If this is your business, whether your intent is to make money or donate your time, you want your audience to ‘buy’ into your music, to support and respect you. Perception begins with you because you are the one in control, when you perform. Reach higher, and set grander goals for yourself as an artist. Promote that you are ‘special’ and have something special to offer your audience. But, before you can accomplish it, you have to believe it, yourself. Substitute ‘guitar’ for ‘accordion’, and suddenly it’s not funny. Believe in yourself, your music, and your instrument. Know who you are and who your audience will be. The more you understand, the better you can anticipate and plan your performance. Show respect for your audience, pride in who you are and what you do. Your audience will respect you and recognize that you care about them and value your relationship with them. That is your objective. 6) Try to mainstream the accordion by starting or joining a band where the accordion isn’t the usual instrument and you are the only accordionist in the group. It can be an refreshing difference to both the audience and to the other musicians in the group. By treating the accordion as though it’s just like any other instrument, ironically, enhances how special it is. 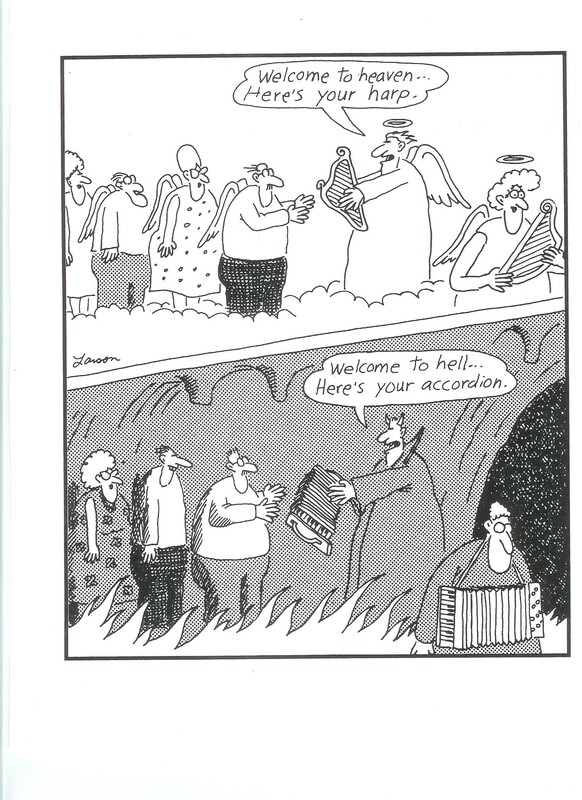 This, more than anything else, promotes the accordion. To be a good accordionist, you don’t have to be the fastest or the loudest player, although that may be a part of what you do. But, keep in mind that music is not an athletic event, and musicians are artists. A good musician is one who is sensitive and knows when to alternate between using restraint and showmanship, when to blend in and when to stand out. A musician is always attempting to emotionally connect with the listener and also to make any artistic judgement as to what the music needs at that moment. 7) Find your voice and sing with conviction! Now that you have everyone’s attention, you might as well sing with the accordion, and learn harmony. Singing with the accordion is seen more now than in the recent past. In reality, most people don’t have great voices, so give it a try. Sheryl Crow gave a fantastic performance accompanying herself with the accordion, when she sang her hit song, “Strong Enough”. 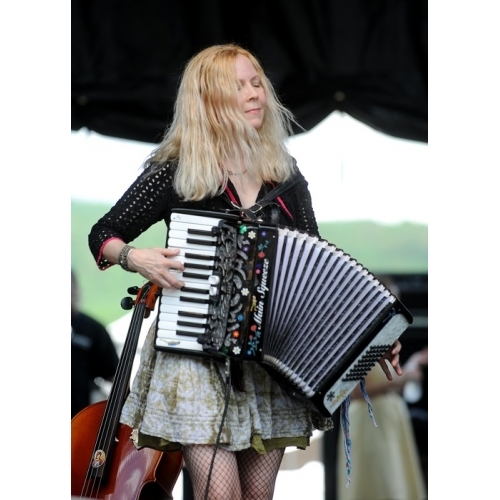 Although she does nothing with the bass section of her instrument, what I particularly love about Sheryl Crowe’s method of playing is that she is a ‘partner’ with her accordion, harmonizing with it and giving it equal time to be heard along with her voice. She could have simply left the accordion in the background, blandly structuring chords to support her voice. Instead, she chose to use a more dynamic approach, which gives her song fullness and warmth and it allows the accordion to have a real presence in her music. 8) Be visible and create your own path. Leave your comfort zone and go out and busk! “Busking” is giving a live performance in a public place. You should check with your city about any ordinances that prohibit busking and where it is permitted. If you get out of your comfort zone you will become more comfortable, confident and perform better each time. It can also be a lot of fun. Live performance is a great way to “test market” your sound, your songs, your image and your ability to relate to an audience. It gives you a chance to assess their reaction to you and what you do. It also helps you to get over your apprehension about appearing in front of others. After a very short while, you are “over it”. You realize that nothing bad will happen to you. People may laugh….but, guess what? You haven’t melted and run away. To those that try to heckle you with their demands because they think they can, just smile, and ignore them (or if they cross your boundaries, either call the police or call it a day.) Performing helps you “build a backbone”, develop patience and character and helps you to learn who you are as a creative individual. Joey Cook busked with the accordion for a long time, winding up on American Idol and finishing fifth in the competition as a singer. Her contribution to the history of the accordion was that she created and presented to America an entirely new, radical image of the piano accordion. Rock on, Joey! Start somewhere and get out there. Look for opportunities to perform in front of others. Some hospitals and nursing facilities look for live acts that present positive performances to uplift and entertain their patients. Also, seniors at your local Senior Center will probably respond well to your act. Join a musical “meet up” group where there are people who play a variety of musical instruments. Take advantage of “open mic” nights that are locally held at restaurants, coffee shops and theaters in your area. Listen to others as well as perform. Get to know those who are positive, empowering and who enjoy being creative with their music and performance. Good people generate good energy and they can get everyone excited about being there. Don’t be afraid to reach out to others for inspiration or collaboration. Also, competition can be interesting. When two collaborate on a song, one can challenge the other to solo to see what you both can create, individually. You can also hone your harmony skills. If available, there is nothing better than an old-fashioned talent contest that will require one to focus and rise to the challenge. In addition to hiring an accordion teacher, take a class about performance to enhance your professionalism. “How to use a mic” to project, is a good topic. Even if you don’t become a professional entertainer or musician, what you learn by being visible is “portable” and can be transferred to other pursuits in your life. It can make you a stronger person, less likely to feel intimidated by uncertainty or by others. If something does not work for you on the accordion, revisit and find out what or how it can work on this instrument. It may be the smallest of details that you haven’t considered that might be bogging you down. Ask your accordion teacher or other musicians for their opinion about your song choice and delivery and how you may improve on your instrument. Listen to others that are more experienced than you are. Don’t let fear hold you back. Model yourself after someone you admire. Your idol doesn’t need to be an accordion player. 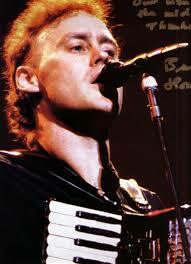 If you have always admired David Bowie, you can apply something of what he did to your accordion performance. Do you admire Ed Sheeran, Bruno Mars, Taylor Swift, New Republic? What musician’s work do you love and what is your vision for yourself? Do not listen to anyone who recommends that you change to another instrument. They are not well-intended and do not have your interests at heart. Jo Ann Castle c. 1957 . 10) Pass on your knowledge to other people. Try to engage their interest by showing them a different kind of music than has been associated with this instrument. The accordion was removed from mainstream American music at a critical time in pop music history. 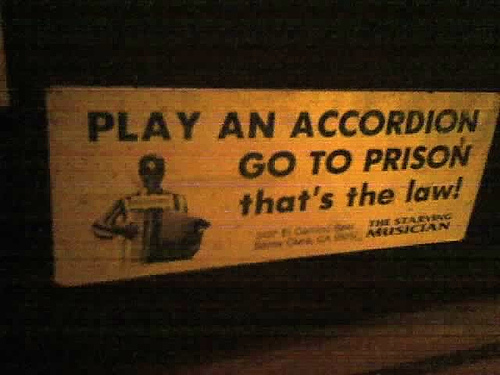 Someone decided that the accordion should not be involved with American music , when it really could have been. As a result, it was left out of the music scene for decades. For performing accordionists that seek publicity, keep in mind that information control is everything. What is said or written about you and your efforts instantly forms an image and an opinion in the minds of the public. It can get people motivated to come out and hear you play. That’s the point of publicity. Or it can completely turn them off, so that they simply stay home. Don’t allow anyone to define you, your music, or your instrument of choice because they don’t know any better. Don’t allow them to tell the ‘same old’ story all over again, and reinforce stereotypes, at your expense. Move the article forward and away from the stupid accordion jokes, and the distant past of the accordion. All of these are a waste of your time and a ‘road to nowhere’ for you. Tell the writer what you expect them to say about you by providing a bio that outlines interesting points that will help them find an angle for your write up. Insist that they focus on your music and you as an artist. You deserve the best publicity that you can get, so be involved and be prepared to establish the ground rules or write your own promotional material. If you are living in America, doesn’t it make sense to promote the music that is rooted in America, and not just play the music of the rest of the world? By the way, those folks perform their own music, brilliantly. Like us, their music represents who they are as a people and has evolved from their shared experience. It is their identity. They have lived it, and they own it. After four hundred years, Americans have developed our own identity, and surrounding us is music that reflects that fact. Don’t be afraid to break with the perception that the piano accordion is a European instrument, because it’s not true. People in the U.S. don’t seem to realize that the accordion is not new to American music. It has been a part of our pioneer experience and has been in America since the mid 1800’s. It has been played, not only in the mountains and the bayous, but by folks in the city and in the country, on the prairie and in the desert, for a long, long time. It was played solo and with orchestras, at weddings, dances and social gatherings for over 150 years. Because it was portable, the accordion was used when pianos and organs were too heavy or delicate to transport. Accordions continued to participate throughout the 20th Century and into the 21st, along with pianos and organs, fiddles and guitars. It was used in the early Blues, the Boogie Woogie, Gospel and every American genre of music. The accordion is a critical piece of our music history and we should be proud of that connection, celebrate it and hold the accordion in high regard because of it. But, the accordion must participate in current music to survive. Update your knowledge of what is going on in Pop music and be open to learning new songs. Listen to the music that is popular and try to adapt your instrument to those songs. 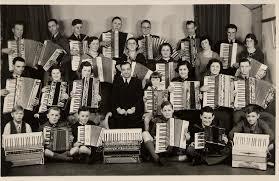 Take your accordion, whatever kind, ignore everyone else’s ‘rules’, go out and find an audience and go make some music! I really love what you said about listening to others who are more experienced than you are and never giving up. My son is learning to play the accordion and is becoming very passionate about his music, so I want to encourage him and help him have a great time. Thank you for the advice about helping him to model his music after someone he admires, even if they aren’t an accordion player. Sherry, Thank you so much for your kind words. When I wrote that, I was thinking of Art Van Damme, a great jazz accordion player from long ago who emulated the style of a big band leader named Benny Goodman and admired him so much that he made it his life’s work to try to duplicate, on the accordion, what Benny did, musically, using an entire band. I suspect that lot of musicians admire others who play other instruments for one reason or another. That would make an interesting article, I guess!